I was recently introduced to a fabulous brand of gourmet olive oils and balsamic vinegars, and I'm really excited to share them with you today! Con 'Olio is a Texas-based company located in Austin. Husband and wife team Jeff and Tabatha Conarko have two locations in Austin. They also sell their fabulous gourmet olive oils and vinegars online, so people all over the country can purchase them as well! They recently sent me a few bottles of their products to try out and share a recipe featuring them with you. I love cooking with flavored olive oils and balsamic, and I can honestly say that Con 'Olio is among the best I've ever used in my kitchen. I received three olive oils and three balsamic vinegars. The oils I received were blood orange, Milanese gremolata, and Cobrancosa from Portugal. All of them are flavorful, with complex flavors. The gremolata is flavored with lemon, parsley, garlic, and a bit of mint. It's perfect for adding flavor to grilled chicken breast or fish. I love it! But? I knew that the blood orange would be my featured flavor. The citrus flavor is perfectly balanced...but not the least bit assertive. The three flavored balsamic vinegars I received were fig, lavender, and grapefruit. The fig is pretty addictive...it's perfect drizzled over figs that are stuffed with goat cheese for simple gourmet appetizer. The lavender has a nice floral finish, and the grapefruit? It's downright addictive, and it pairs perfectly with the blood orange olive oil to make a citrus vinaigrette. I used the vinaigrette to flavor a light, yet filling pasta salad: Refreshing Chicken-Berry Pasta Salad with Citrus Vinaigrette. The evenings are still quite warm here in Texas, so light dinners like this are perfect when you don't want to eat something heavy. With a double shot of protein from chicken and feta cheese, this pasta salad isn't heavy, but it is filling. The berries add a pop of color and flavor, and a few nuts provide a bit of crunch. This would be perfect for any end-of-summer potlucks that you might have planned. It makes a large amount, so you're likely to have leftovers. Luckily, it tastes even better the next day! Step 1: Cook 8 ounces penne pasta in well-salted water. While the pasta cooks, make the vinaigrette. Add the following ingredients to a measuring cup: 1/4 cup Con 'Olio blood orange olive oil, 1/3 cup Con 'Olio grapefruit balsamic, 1 tsp. honey, 2 tbs. finely diced shallot, and salt & cracked black pepper to taste. Whisk well to combine and set aside. Step 2: Season 1 lb. boneless chicken breasts with salt and pepper to taste. Sear in 1 tbs. olive oil in a non-stick skillet over med-high heat. After they cool, cut into bite-sized pieces. Combine the following ingredients in a large mixing bowl: the cooked pasta, cooled chicken, 1 cup blueberries, 1 cup chopped strawberries, 1/2 cup crumbled feta, and 1/2 cup pecans. Step 3: Add the citrus vinaigrette and toss well to evenly coat all the ingredients. You can serve the pasta salad immediately at room temperature, or you can chill for 1-2 hours to allow the flavors to develop. This pasta salad is so good...the fruit combines perfectly with the sweet-tart citrus vinaigrette! The salty feta and crunchy nuts provide the perfect contrast of flavor and texture, and the chicken provides protein to keep you full. Put it all together, and you have a fabulous weekend lunch or summertime dinner. If you live in the San Antonio-Austin area, make sure to go visit one of Con 'Olio's two locations. They allow patrons to sample all of their flavors of olive oil and balsamic, so you'll know if you love it before you ever walk out the store! I have my eye on two other flavors that I want to try ASAP: Meyer lemon olive oil and dark chocolate balsamic. Both sound insanely delicious! 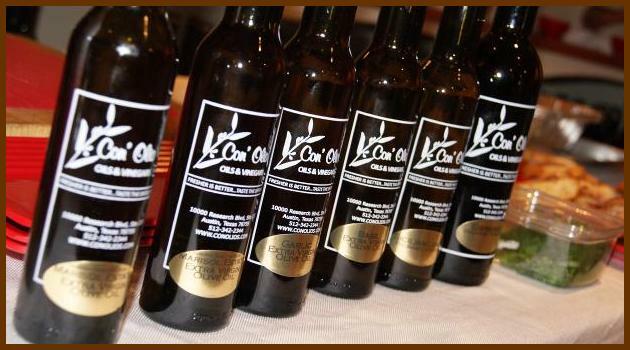 Disclaimer: Con 'Olio sent me complimentary bottles of their olive oil and balsamic in order to facilitate this post. The opinions expressed are solely mine. At the end of the summer, I eat nothing but pasta salads and berries because I want to cram it all in before it's over! YUM! You would love this salad, then! I'm going to drive up to Austin next weekend to visit Con 'Olio in person and sample some more of their fab flavors. You're welcome to drive down and meet and do lunch afterward if you want! It's still mighty hot here, so this refreshing pasta salad looks great! love the addiition of the citrus vinaigrette - yum! It's not heavy, but it will fill you up thanks to the chicken and the cheese! Delicious! Hope you post about your visit to Con 'Olio. Have a great time in Austin. I will likely post pictures on my Weekend Gourmet Facebook page, but my September posts are nearly booked. Not sure I'll be able to fit in another Con 'Olio post here on the blog.